The Reception of Doctor Zhivago; The Place of Doctor Zhivago in Pasternak’s Art; Characters and Plot; The Genre of Doctor Zhivago; The Cultural Inheritance of Doctor Zhivago; Gender and Ethnicity; The Meaning of History in Doctor Zhivago; Doctor Zhivago in English Translation. 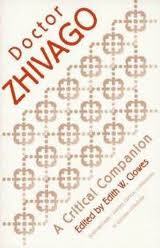 Concludes with a look at the contemporary reception in Russia and the value of Doctor Zhivago to Western readers today. A discussion of how Yuri Zhivago’s poetry made its way to and was received by the public within the novel and how that reception changes over the course of the novel. In essence, how the artist-government-public relationship goes from quite open to very restrictive and censorious. An examination of the personal love relationships in Doctor Zhivago based on the philosophical differences between Solovyov’s “The Meaning of Love” and Tolstoy’s “The Kreutzer Sonata.” He examines the relationships of Lara and Komarovsky, Lara and Pasha, and Yuri and Lara, finding the ways in which Pasternak differed from both Tolstoy and Solovyov. A critical evaluation based on Pasternak’s stated intent to create an “epic” novel. Gasparov uses the “melodrama” and extreme coincidence (as “the mainspring of the plot”) to make his point by interpreting these elements as the counterpoints of polyphonic music (movement, rhythm, sound) for “overcoming … the linear flow of time.” The author then shows how these “contrapuntal lines” are interwoven to form a complete fabric – the “crossing of fates,” of memory and essentially, of death. One strength of the novel is that it is open to a variety of possible interpretations. And he pronounces this a very sophisticated work. Excerpts related to the novel between Pasternak and Olga Freidenberg, Adriana Efron, Varlam Shalamov, N.P. Smirnov, John Harris, and Stephen Spender, dated between 1946 and 1959.